Born in Elizabeth, New Jersey in 1925, Gus A. Stavros is a 1948 graduate of Columbia University, majoring in Business Administration. Mr. Stavros served with General George Patton and is a decorated WWII veteran. 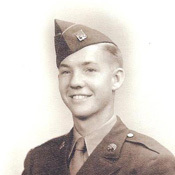 In his oral history interview, he tells a remarkable story about a traumatic injury he suffered during the war and the touching follow-up letter he received from a fellow soldier. Following the war, Mr. Stavros made his mark in the business world by starting a business forms manufacturing company. After 30 years of building the company into the largest forms manufacturer in the Southeast, Mr. Stavros sold his company in 1989 and retired to join his wife, Frances, in serving the community full time in education, culture, and other major charitable causes. Below are excerpts from an oral history interview with Gus Stavros describing his childhood in New Jersey, his experiences in World War II, and his optimistic outlook on life. The oral history interview was conducted by Jim Schnur, Special Collections Librarian, Poynter Library, University of South Florida St. Petersburg in January 2009. Speaks about growing up in New Jersey during the Depression including: learning to save money and how he has always strongly believed in budgeting. Talks about going to Columbia on scholarship. Describes where he was on December 7, 1941 and what he did afterward in school. Talks about being at University of Florida for training and how much he loved Florida. Describes being moved to Camp McCain in Mississippi and a “volunteer” assignment where an accident killed one soldier and blinded another. Speaks about going overseas including crossing on the Queen Elizabeth-where he was bunked down on the 9th level of the ship, but was allowed to sleep on deck. They landed in Scotland where people were wonderful, and continued down to London and then landed on Utah beach after D-day. Describes seeing Fred Astaire in person and being in London when V-2 bombs are falling on London. A job to do: Talks about being 19 and being afraid but having a job to do – WWII was necessary. Compares WWII to Vietnam and Iraq. Talks about landing on Utah Beach where there were no remaining signs of invasion. Discusses first assignment as a holding action and then how/why and what happened when sent to the enemy line. 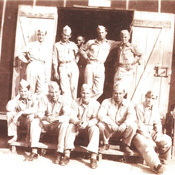 Tells the story behind a letter he received from a fellow soldier whose life he saved by volunteering in his place – what happened, explosion, head injury, surgery, and plate in head. Includes poignant stories of the loss of friends during war, the battle of Nenig, a difficult decision he had to make about whether or not to shoot someone, digging foxholes in the open air, a battle he witnessed between a Panzer Tank and a General Sherman Tank, being attacked by 400 Germans, and then the story behind his massive war injury. Describes his return to the battlefield at Nenig 50 years later and the warm welcome he received. Describes visiting a war cemetery in Nenig that had American and German soldiers - some German soldiers as young as 13. Talks about being the tip of Patton’s army; being the first into Germany; a book his daughter found mentioning his division; a mention of his wound in another publication, which describes him praying in Greek after his injury; anniversary of day he received his head wound (64 years); last time he used his left hand; and visits to head wound victims of Iraq war. Tells the story of meeting his wife who used to arrange dances for the GI’S, danced with him, promised to write, etc. Talks about how she joined the WAVES. Talks about getting a car after the war, going back to school, and holding hands with Frances between classes. Includes a remarkable story about meeting Winston Churchill after war, and experiences with Dwight Eisenhower at Columbia. Speaks about how fortunate he has been in his life and some of the people he has met. Talks about entering business and moving to St. Pete including how his Dad wanted him to buy A&W fast food restaurants and starting a forms business that became very successful. Talks about the Florida Dream. Talks about work at University level. Discusses the opportunities available to college graduates today because of technology. Speaks of the importance of a positive attitude and education. Discusses crises in funding at Florida universities. Army Qualification Record for Gus A. Stavros. Honorable Discharge certificate for Gus A. Stavros. Newspaper clipping of story about the reality of war. Letter from Russ Sanoden to Gus Stavros thanking him for saving his life. The Florida Humanities Council, the state affiliate of the National Endowment for the Humanities, uses the disciplines of the humanities to develop public programs and resources that explore history, literary and artistic traditions, cultural values, and ethics. Click here to visit the homepage of FHC. This website has been underwritten in part by a grant from the Duckwall Foundation. Copyright © 2009—2019 Florida Humanities Council. All Rights Reserved. Click here to visit the homepage of FHC.